Reporters always ask us about it during high-profile aviation and rail investigations. After the sinking of the El Faro cargo ship during Hurricane Joaquin, the news media closely followed the recovery of the voyage data recorder, which was located in about 15,000 feet of water. The black box, which is usually orange with reflective tape to make it easier to locate in wreckage, can be critical to our investigations at the NTSB. These devices can withstand enormous impact forces, intense temperatures, and the extreme pressures of ocean depths. Recorders capture a range of useful data, from crewmembers’ actions and conversations to vehicle parameters. We use these data to help identify the cause of an accident and to make recommendations to prevent such accidents from happening in the future. Industry can also use this information to make transportation safer. We analyze recorder information in all modes of transportation. We transcribe audio from cockpit voice recorders and extract information from flight data recorders on aircraft. We review voyage data recorders that provide ship data, bridge audio, and radar images on vessels. We assess information from event recorders and forward- and inward-facing video recorders on trains. We analyze a variety of recorders and cameras that provide performance information on highway vehicles. No matter what type of recorder we encounter, we are required by law to protect the information obtained for our investigations. 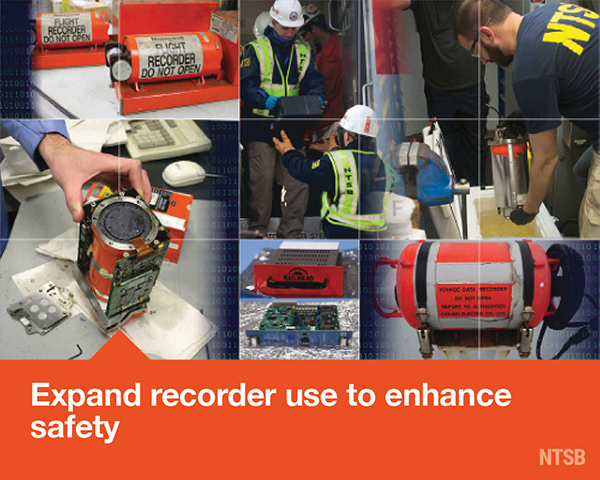 Although the NTSB uses recorders to learn from one tragedy to prevent future ones, industry and operators can install recorders and develop programs to learn lessons from normal operations. The NTSB urges the transportation industry to install recorders in their vehicles, vessels, trains, and aircraft, and to assess the data collected from them to prevent accidents and assess operator performance. Industry can use information from data, audio, and video recorders to identify issues of operational weakness or noncompliance with procedures. Airlines use the data they gather in everyday line operations through flight operational quality assurance (FOQA) programs to prevent accidents from occurring in the first place. Although most large aircraft are already required to have flight data and cockpit voice recorders, we have also recommended that they have cockpit video recording systems, and we have recommended that certain small aircraft that are not required to have recorders be required to carry recording devices that capture data. For smaller aircraft, recorders can provide crucial accident data, and they can also be a vital part of flight data management programs. We appreciate the special value of data from video recorders, and that’s why many of our recent recommendations to regulators and operators propose that video recorders be installed to capture operator and crew behavior. Currently, investigators have no access to the visual information from an accident sequence. Although we can piece together key events in an airplane accident from cockpit audio and flight data, with video we have access to nonverbal communications and cockpit instrument manipulation. 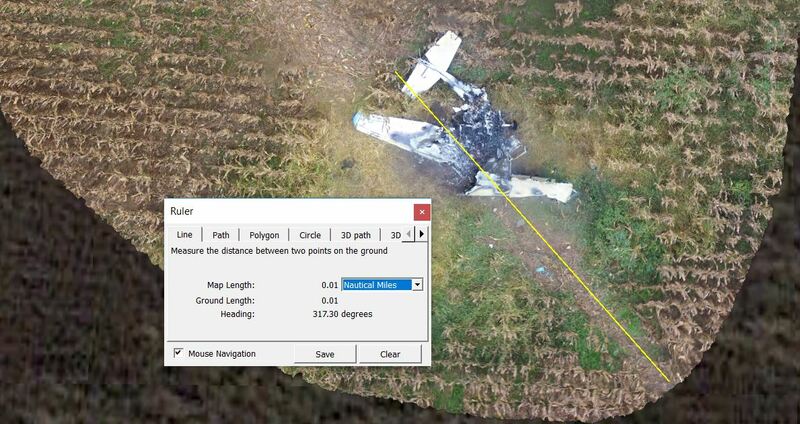 In fact, our NTSB scientists have even written software that reads needle positions and creates valuable data tables based on cockpit images! Reconstructing the accident sequence without video evidence requires additional time and effort—possibly delaying critical safety improvements. What can be learned when inward-facing video is available? The answer is apparent from our 2014 investigation of the mid-air breakup of SpaceShipTwo during a test flight. SpaceShipTwo was equipped with data recorders, including video recorders to document the flight test. Because of those video images, the NTSB was able to identify quickly (by the second day of the on-scene investigation) that the co-pilot moved a lever at an inappropriate time, which ultimately resulted in the crash. It is indisputable that we can make transportation safer by using information obtained from recorders. That’s why “Expand Recorder Use to Enhance Safety” is on the NTSB’s Most Wanted List of transportation safety improvements. And that’s why we urge transportation operators to install this important safety technology as soon as possible. Throughout its history, the NTSB has prided itself on staying on the cutting edge of transportation technology. One of the most revolutionary changes ever to come about in aviation is the recent explosive growth—in number and capability—of unmanned aircraft systems (UASs), or drones. Last year, the number of registered UASs exceeded the number of manned aircraft. Nothing has drawn as much attention in aviation as the UAS revolution. This phenomenon didn’t surprise us at the NTSB. 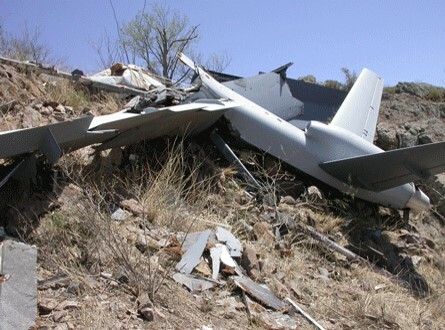 Our first occasion to investigate a UAS accident came in 2006, with the crash of a Customs and Border Protection Predator-B MQ-9 near Nogales, Arizona. That investigation gave us a glimpse into the future of civil commercial drone use. In 2008, we held a public forum on UASs. Soon after, we officially acknowledged that UASs represented an expansion of the aviation world that we needed to thoroughly understand. My entry into the world of UASs began with a side task: learn enough to update Title 49 USC Part 830. We published a revised regulation in August 2010, clarifying the NTSB’s role in investigating UAS accidents. The revision remains valid today, even with all the changes in the industry, and so far, civil, nonhobbyist UASs have a very good record: at the time of this writing, they have caused zero serious injuries and resulted in zero confirmed collisions. 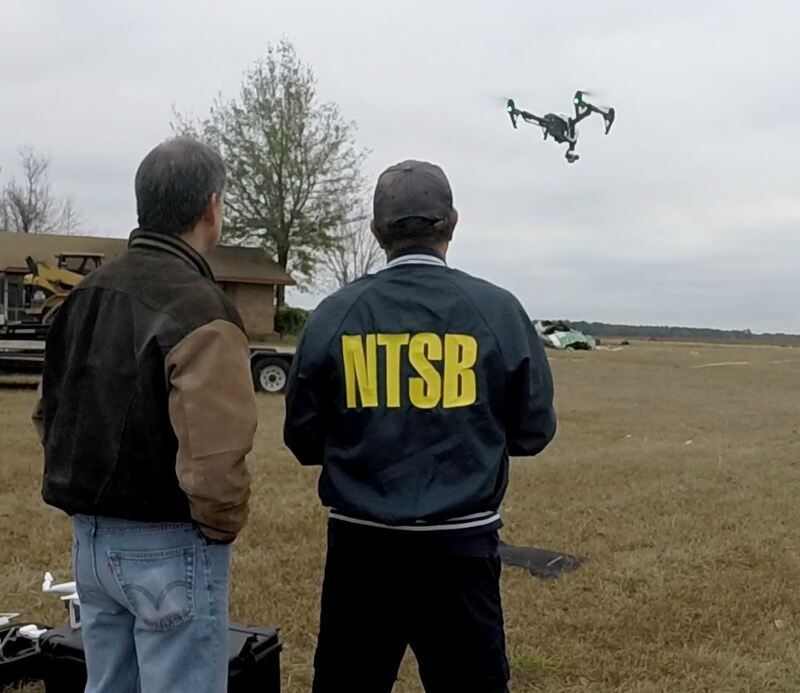 The NTSB began experimenting with small UAS (sUAS) technology that could support on-scene accident investigation in 2013. 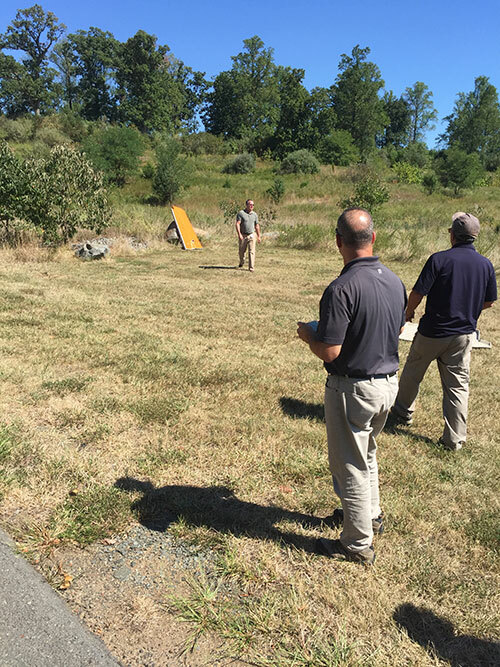 By 2015, we had taken the first real steps toward using UASs to support multimodal accident documentation, obtaining authorization to research sUAS methods and to fly in the DC Special Flight Rules Area, and we began test flights. In early 2016, we started the process of obtaining a public agency Certificate of Authorization (COA) and also began procedures to expedite access to controlled airspace. In April, we made our first flights over an accident site under the COA. We kept up with the quickly expanding rules for flying small UASs. The FAA published the sUAS Part 107 regulation in August 2016, and we were one of the first in line for a Part 107 certificate. Since then, we’ve developed Federal Flight Program documentation and procedures, conducted more deployments, and obtained our “flagship” drone, a DJI Inspire. With photogrammetry, an orthomosaic can be created in less than an hour. As we started to gather information and gain experience with drones, we quickly realized that sUASs and their associated technology—small, high-resolution cameras and processing software—would be great tools for NTSB investigations. One such use of this technology is photogrammetry, which, using pixels from multiple photos of an object or area, creates a 3-D model or an orthomosaic (a map with geographical coordinates throughout). 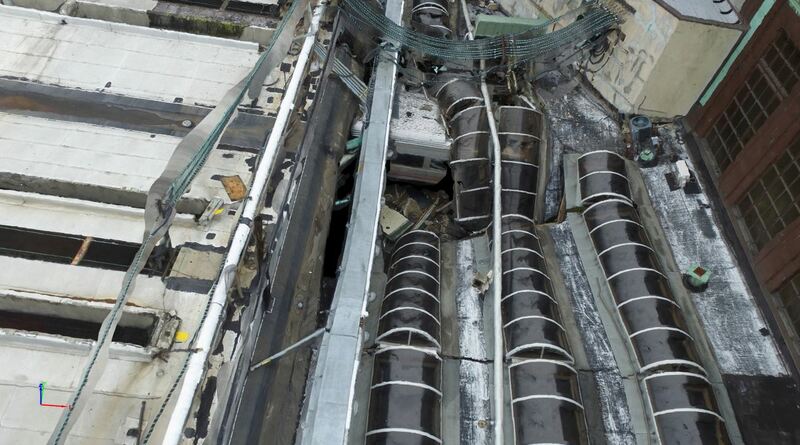 We know the value of aerial photographs; there is hardly a major NTSB accident report without an aerial image in it. 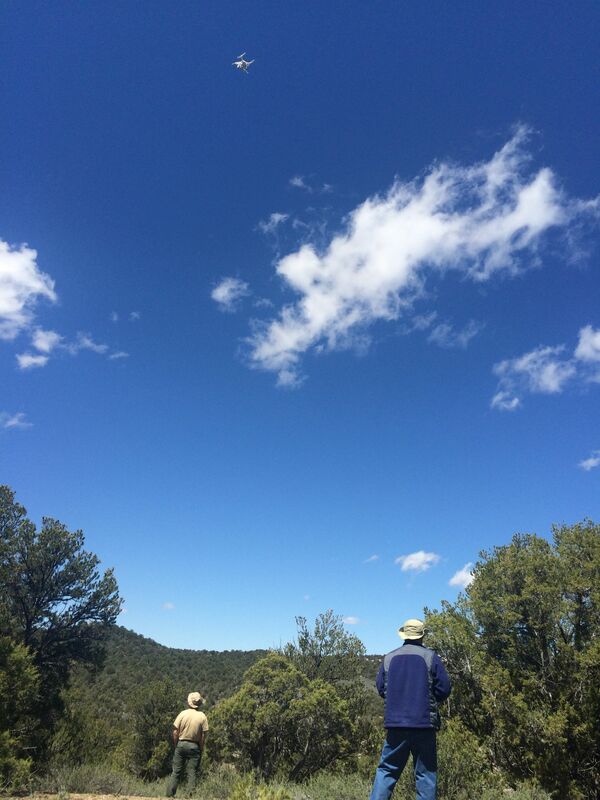 But with a drone, we can now take high-quality photos, our investigators can specify the most important points of view, and we can immediately review the results. We can re-fly an approach path to view witness marks or runway alignment and quickly obtain high-quality photos of hard-to-access areas (for example, a plane crash into a building that our investigators cannot safely enter). Photogrammetry, especially when it’s enabled by digital GPS-referenced photos, is the real game changer. Gone are the days of hunting through dozens of photos for just the right point of view, or scribbling down a few GPS points and hoping you took the right measurements. Orthomosaic maps and 3-D models let you go back for whatever you need. Our team continues to deploy to accident sites in aviation and rail, and we can now can deploy a drone to an accident site on request—with our COA approval, we can even get the OK to fly in controlled airspace within hours—and our photogrammetry-trained staff continues to grow. Every time we document an accident site, we learn more and get better at using the equipment and techniques. We intend to keep growing the UAS program and the ability to bring in external partners. Building this program has had an unanticipated side benefit: To operate the drone, which is an aircraft by all definitions, we developed a flight program following the Interagency Committee for Aviation Policy template. Now, anyone who wants to be involved in any aspect of flight operation—whether it be by putting together safety and operational procedures, developing training and standardization, or carrying out safety reporting/SMS activities—has a way to participate in our own little flight department! As we grow in our knowledge of UASs, we’re able to maintain our high investigative standards in an expanding segment of aviation and improve our investigative techniques, giving our investigators an opportunity for hands-on experience. Bill English is an Investigator-in-Charge in the NTSB’s Major Investigations Division and leads the UAS program. He is a current CFI-I who holds an FAA remote pilot certificate and a graduate certificate in geospatial intelligence. As a public health professional, I have spent my career working in the United States and internationally to prevent injuries and deaths. At the NTSB, one of my primary roles is to advocate for the changes needed to prevent transportation accidents. Significant advancements have been made to improve the safety of occupants in the front seats of passenger vehicles, including the development of advanced restraint and airbag systems, safer seat designs, and structural improvements to minimize injury due to intrusion. Today, 32 states have adopted legislation that requires front-seat passengers to use a seat belt, and we can celebrate that we have achieved a national daytime average seat-belt-use rate of 90 percent for front-seat passengers. But what about rear seats? We have not seen similar technology advances in rear seats, and research shows that rear seat belt use is considerably lower, at 83 percent. How can research, engineering, and advocacy make an impact in increasing rear seat belt use? In 2015, after decades of decline, the United States experienced the largest increase in motor vehicle crashes and resulting deaths. Another historic increase is expected for 2016. In examining such a complex issue, we at the NTSB found ourselves asking the following: why aren’t people buckling up when they sit in the rear seat, and how can research, engineering, and advocacy increase rear seat belt use? 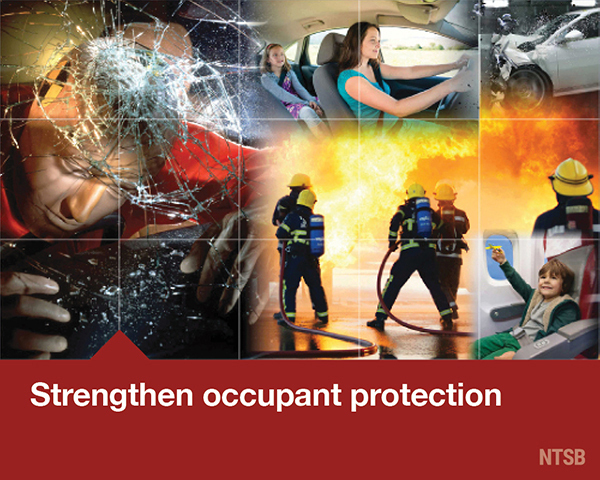 To answer these questions, we reached out to occupant protection experts drawn from the auto industry, the research community, safety advocates, and the government to participate in a workshop to help us find ways to strengthen occupant protection in the rear seat of passenger vehicles. During the workshop, we discussed the current knowledge about rear seat occupants in motor vehicle crashes, and how these occupants utilize existing vehicle safety systems, such as seat belts. We examined how the rear seat environment is different from the front, both in design and user demographics. The workshop also addressed advanced vehicle and emerging seat belt technologies, innovative seat designs, as well as areas of needed research and education. Our workshop was designed to allow the sharing of experience and knowledge, as well as to encourage participants to collaborate on inventive strategies. As a result, in the detailed summary we are publishing today, participants identified short- and long-term goals that will require a greater amount of collaboration, engineering, design, and advocacy to achieve. Together with researchers, automobile manufacturers, legislators, regulators, and safety advocates, we are identifying practical, real-world applications and opportunities to make rear seats safer for everyone. For more information about the workshop, presentations and the summary document visit https://www.ntsb.gov/news/events/Pages/2016_rss_WS.aspx. Super Bowl LI is Sunday, and the New England Patriots and Atlanta Falcons undoubtedly have their game plans in place. The players aren’t the only ones that need to be prepared on game day. Fans at the NRG Stadium in Houston, at Super Bowl parties, and at sports bars must have their transportation plans lined up before kickoff to ensure a safe and enjoyable day. Super Bowl Sunday is thought of by some as a national holiday, and, like many other holidays in the United States, many Americans celebrate with food, friends, and alcohol. This means that, like other holidays, we often see an increase in alcohol-impaired motor vehicle fatalities. Such a day of healthy competition, camaraderie, and celebration should not end in tragedy due to something that’s 100% preventable. That’s why I say the best defense is a good offense—not only for football players, but also for fans. 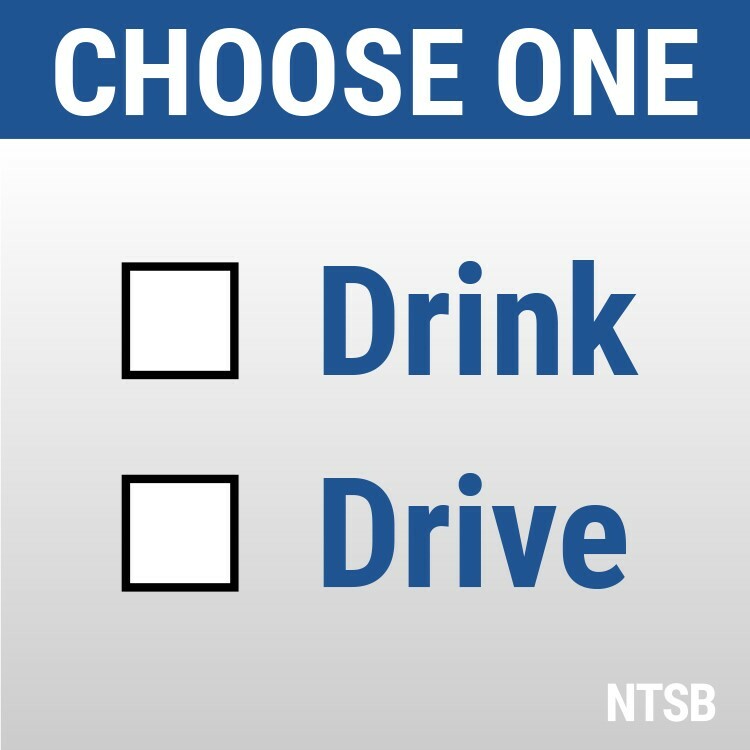 And a fan’s defense on Super Bowl Sunday should be to choose—in advance—to either drive or drink, but never both. Impairment begins with the first drink, and taking a chance on driving because you “only had a few” is a risky play that could endanger your life and the lives of others. By designating a sober driver as a key part of the game-day festivities, safety is increased and the likelihood of being in a crash is significantly reduced. Sometimes everyone wants to celebrate, and that’s OK, as long as everyone has a sober ride home. In this day and age, there are many ways to get home safely, whether by taxi, public transportation, or by using NHTSA’s Safer Ride app. Or, go for the MVP title this year and volunteer to be the designated sober driver for your squad, making sure everyone arrives safely at their destination postgame. That’s a guaranteed win! Remember: you can drink responsibly, you can drive responsibly, but you can never drink and drive responsibly. Make your choice, stick with it, and enjoy the game!